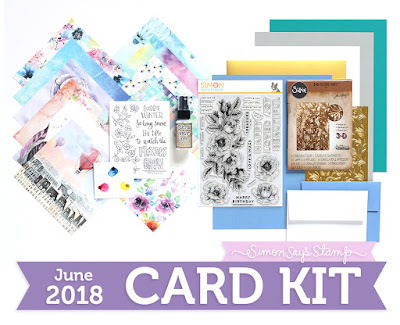 Oh my goodness, did you see the latest June 'Fly Me Away' Card Kit from Simon Says Stamp! It is GORGEOUS!! I made a couple of cards using the kit to share today. I then stamped and coloured an individual flower and coloured using the watercolor paints in the kit plus a touch of Zig Marker Pens. I added a couple of strips of Washi Tape and White Metallic String and then added a vellum sentiment banner. and I finished the inside by stamping the flowers using Archival Shadow Grey Ink and adding a sentiment. For my 2nd card I used the gorgeous printed watercolour panel from Suzy Plantamura. I wanted to add some dimension to the panel so I carefully cut around the flowers and then coloured the panels. I went along the edge using a distress tool and then added a border of Prisma Glitter. and this is the kit! Click on the pic to go directly to the kit. Unfortunately it has already sold out but the items are still available to buy individually.